We have a feeling of deep concern regarding the pending legislation on Federal aid to science. We share the belief of the sponsors of this legislation that expansion of our scientific work can yield returns of great benefit to the Nation. The manner in which this aid is administered is vital to the success of any program undertaken. We have studied this matter, and we transmit to you our considered opinion on the two administrative plans which you now have under discussion. It is our belief that the top authority in the proposed National Research Foundation should rest in a Board or Commission of scientists and laymen chosen by the President on the basis of interest in and capacity to promote the purposes of the Foundation, and not in a Director who would be aided by a board with only advisory duties. The responsibilities of the top authority will be so great and the fields to be covered are so extensive that only a broad and representative board of most able men could effectively assume this responsibility and authority. We believe that the Foundation can achieve its objectives better by grants to institutions for the support of broad fields of scientific research and scientific education than by contracts for research on specified and closely limited problems. We believe that the Foundation should not supervise or direct research activities of other Government agencies, and should not have the duty of surveying these activities, but should arrange for suitable interchange of information between Government agencies and research men carrying on work with the support of the Foundation; and that officers of other Government agencies should serve ex officio on certain advisory panels of the Foundation, such as an Advisory Panel to the Division of National Defense, but that no such ex officio members should serve on any Board or Commission of this Foundation to which authority is delegated. Recognizing the great need of study of human relationships, we believe that the Foundation should provide suitable support for the social sciences and humanities as well as for the medical and natural sciences, that the social sciences and humanities should be suitably represented in the membership of the Board or Commission, and that provision should be made for scholarships and fellowships in the social sciences and humanities as well as in the medical and natural sciences. 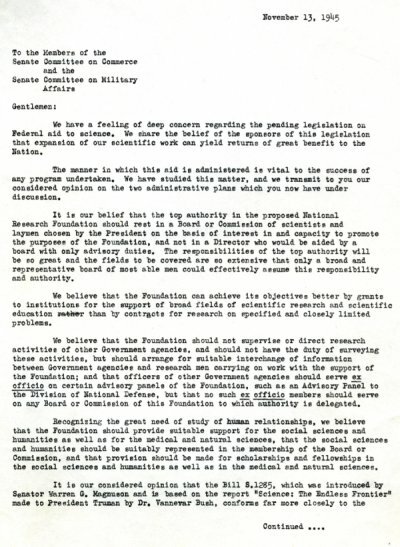 It is our considered opinion that the Bill S.1285, which was introduced by Senator Warren G. Magnuson and is based on the report "Science: The Endless Frontier" made to President Truman by Dr. Vannevar Bush, conforms more closely to the requirements stated above than does the Bill S.1297, which was introduced by Senator Harley M. Kilgore, and we urge that you recommend passage of the Magnuson Bill S.1285 (Committee Print of October 12, 1945), in order to achieve the maximum benefit from scientific research for all of the people.